Every breath they take: Passengers pay for air con at Caracas's main airport. 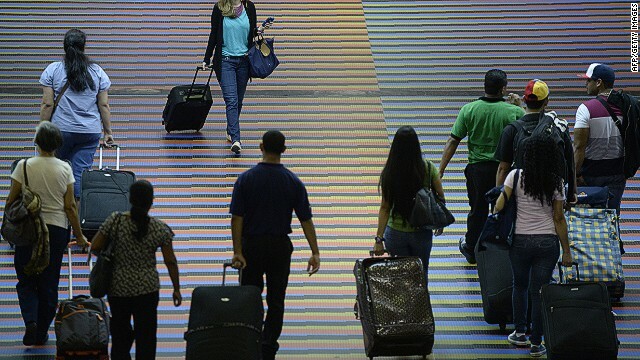 (CNN) -- Plane passengers are used to paying for check-in baggage or priority boarding, but one airport in Venezuela is now charging for the ultimate hidden extra -- air. Anyone departing from the Simon Bolivar International Airport of Maiquetia in Caracas now faces a levy of 127 bolivars ($18) to pay for a new air conditioning unit installed earlier this year, according to a statement on the airport's website. The airport says its air conditioning system "eliminates contaminants" and injects ozone into the atmosphere to improve the environment and protect the health of passengers. It boasts that the system is the first of its kind in an airport anywhere in South America and the Caribbean. The "breathing tax" which came into force on July 1 and must be paid by all domestic and international passengers to airlines at check in, has generated bemusement in Venezuela, with many taking to Twitter to criticize the measure. "While the stench of the toilets asphyxiates me ... they have started to charge 127 bolivars for breathing the ozone," wrote Vero (@VeronicaTorresA). Mientras el hedor de los baños asfixia "@la_patilla: Comienzan a cobrar 127bolívares por respirar ozono en Maiquetía http://t.co/SD870X9vMB"
Another, Chipopo (@ELvDav) comments that whatever task the air conditioning unit performs, it doesn't seem to include lowering the temperature. El aeropuerto de maiquetia esta como a 36@C debe ser la inyección de ozono q dispara la temperatura. "Maiquetia airport is 36 C, it must be the injection of ozone that makes the temperature shoot up," they write. Daniel Martinez (@DanielMartinezD), a radio presenter, tweeted his gripes about the measure. "Could you explain to me the ozone thing in Maiquetia? The toilets have no water, the air-con is broken, there are stray dogs inside the airport, but there's ozone?" Several international airlines, including Air Canada and Alitalia have suspended or reduced flights to Venezuela in recent months, blaming strict government currency controls that they say have have left them billions of dollars out of pocket. Earlier this week the country's air transport minister, Luis Caraballo Graterol, insisted in an interview that Venezuela had no debts to foreign air carriers. MORE: Would you stand on a plane to cut costs?